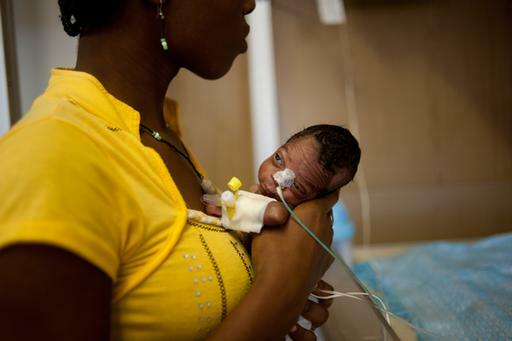 Three years after the 2010 earthquake, the Haitian health care system is still devastated. Médecins Sans Frontières/Doctors Without Borders (MSF) continues to manage four hospitals built to replace the temporary structures that it set up immediately after January 12, 2010. Thanks to these facilities, tens of thousands of Haitians benefit from free, high-quality care. However, Haitian authorities are unlikely to take over MSF’s activities in the foreseeable future. “The transition process is much too slow,” says Joan Arnan, MSF’s head of mission in Haiti. “That’s because Haitian institutions are weak, donors have not kept their promises, and the government and the international community have failed to set clear priorities.” On January 12, 2010, most of the hospitals in the earthquake zone were either destroyed or seriously damaged. The inadequate response to the cholera epidemic—the other catastrophe that struck Haiti in 2010—demonstrates the delays in the health system’s recovery. Haiti has experienced recurring outbreaks of the disease since that time. During 2012, more than 22,900 cholera victims received care in MSF’s cholera treatment centers in Port-au-Prince and Léogâne. The number of cases increased after hurricanes Isaac and Sandy last fall, when rains caused open sewers to overflow and led to the spread of the bacteria that causes the disease. Despite the recent drop in the number of cases, as of late 2012, MSF was still treating more than 500 cases each week. “The majority of the population lacks access to drinking water and proper sanitation, but cholera treatment has still not been properly integrated into the few existing public health facilities,” Arnan explains. For example, in Léogâne, approximately 30 kilometers from Port-au-Prince, several humanitarian organizations fighting the epidemic have pulled out for lack of funding. Since that time, the number of patients admitted to MSF’s treatment unit has grown. The same is true for the situation in Port-au-Prince. MSF cholera treatment centers in Delmas and Carrefour remain the only possibilities for patients and, instead of a decline, MSF sees an increase of patients as a direct result of other actors leaving. Léogâne, the city closest to the earthquake’s epicenter—much of which was destroyed by the quake—today resembles a huge construction zone. Most of the people who survived have been re-housed. However, the MSF hospital is the only facility in the region offering free care available around the clock in case of emergency. MSF arrived in Léogâne just after the earthquake and set up a tent hospital to treat quake survivors. This temporary facility was replaced by a building made of shipping containers, which opened in September 2010. In addition to maternity care, the hospital treats medical emergencies and has a surgical unit. Most of the surgeries performed involve women requiring Caesarean sections and victims of road accidents. Outpatient consultations are held in another building, for pregnant women and children under five years of age. Other medical facilities regularly refer patients to the MSF hospital, from simple labor and delivery cases to complicated ones that require a Caesarean section and, thus, an operating room that functions 24 hours a day. “The hospital fills a gap that existed well before the earthquake,” Arnan says. “Most Haitians did not have access to medical care before January 12, 2010, whether because of the lack of available services or because they didn’t have enough money. MSF launched its first projects in Haiti in 1991, carrying out emergency programs during natural disasters and crisis situations. Over the 10 months-period following the January 2010 earthquake, MSF teams treated 358.000 patients performing 16.570 surgeries and assisting at 15.100 births. More than 80% of the $155 million raised in 2010 for MSF emergency operations in Haiti was spent during that period of time. From late October 2010, MSF responded to the cholera outbreak, treating 170.000 patients in a year at a cost of $45 million. Today, MSF still manages four hospitals in the earthquake-affected area: the 110-beds reference centre for obstetric emergencies opened in April 2011 in Delmas; a 130-beds trauma hospital transferred in May 2011 to Drouillard, close to the slum of Cité Soleil; the 110-beds surgical center Nap Kenbe opened in February 2012 within Tabarre industrial park and a 160-beds hospital in Léogâne. In 2012, about 30,000 patients have been admitted in one of these hospitals. MSF also treated nearly 23,000 cholera cases in specific treatment centres in Port-au-Prince and Léogâne. MSF currently employs nearly 2,500 people in Haiti, 95% being Haitians. Human resources represent about half of the $50 million total annual budget.